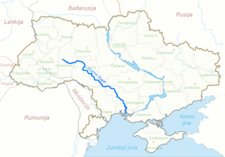 This is a list of the major rivers that flow through Ukraine. Ukraine, a country on the continent of Europe, has many rivers. The most notable rivers of Ukraine include the: Danube, Dnieper, and the Dniester. A NASA satellite image of the Dnieper and its tributaries. The Dnieper River passes through many cities. Namely, Kyiv, the capital of Ukraine. In Kyiv, more than seven bridges cross the river. A map of the Southern Buh flowing through Ukraine (in Lithuanian). Note: The following rivers are listed from west to east. Rivers listed in bold are either major rivers, or near or about 1,000 km. long. Wikimedia Commons has media related to Rivers of Ukraine. This page was last changed on 11 March 2016, at 00:01.